DOWNLOAD THE PREVIEW TO ACCESS ALL OF LETTER "A"! 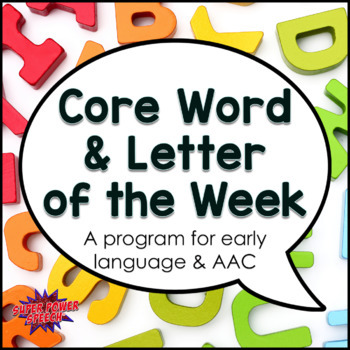 The “Core Word and Letter of the Week" program was created to help your preschool and early language learners communicate! This program makes lesson planning a breeze, give you more time to focus on students, and help you teach crucial language skills. You can see videos of these products in action here. The “Core Word and Letter of the Week" program was created to help make your lesson planning a breeze, give you more time to focus on students, and help you teach crucial language skills. 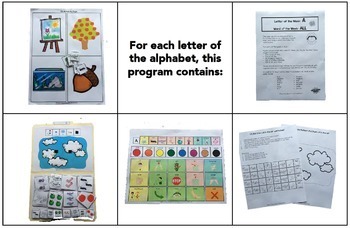 Included in this download are easy to implement sets of activities, worksheets, and ideas focusing on CORE vocabulary for every letter of the alphabet. Core vocabulary is used for 94% of all the words spoken, and therefore most important vocabulary for all early language learners. Core vocabulary provides flexibility to request, comment, ask for help, and engage socially. It is the foundation for later language. With “Core Word and Letter of the Week", you will use a systematic way to teach the alphabet and increase phonics skills. My teachers and I have chosen to teach the letters in alphabetic order, however, they could be taught in any order that works with your other curriculum. Because there are more weeks in the school year than letters of the alphabet, go back and start over after finishing the first round. ❤️ "It's as if you read my mind and knew exactly what I needed for my student! I was trying to figure out how to create a curriculum for my students who are nonverbal and use AAC, and then your email came. 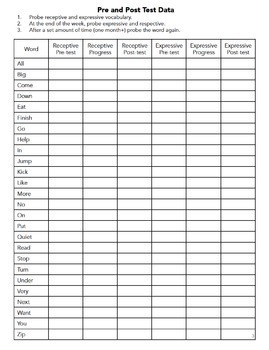 :) This is an amazing product in that it combines literacy and core vocabulary. 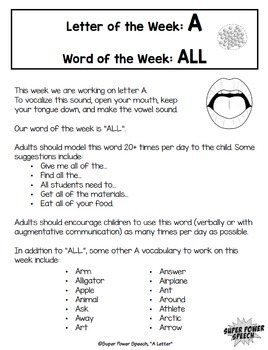 I love the variety of weekly activities and the parent/teacher strategies to support language learning throughout the child's day. Thank you - thank you - thank you!" ❤️ "This is going to MAKE my year!!!!! I am working closely with one of the kindergarten teachers this year with a special transitional K class for children too old for pre-k, but not ready for gen ed K. I was looking for something like this and now that I've looked at it, there's so much more than I expected. Love it already." ❤️ "WOW! WOW! WOW! This product is amazing and will be a great addition to my cooperative teaching opportunities in a busy preK classroom as well as with my AAC user who is very capable of this work. I'm so excited! I can see exactly how it will fit into/replace my plan - for the better!" Hi! I'm Cheri Dodge Chin, SLP and doctoral student. I'm an Ivy League graduate and creator of one of the first and longest running speech therapy blogs in the world, Super Power Speech. Since graduating with my master's degree in 2000, I have worked in schools, clinics, hospitals and private practice. I am a national presenter and have taught students around the world in my online courses. In my free time, you can find me playing soccer with my two teens or reading three books at the same time (in front of the fire, while crocheting).